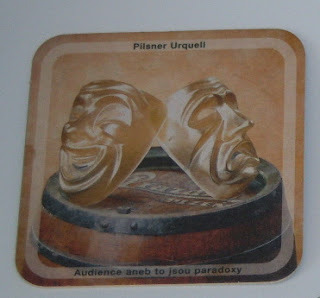 Pilsner Urquell coaster. Happy face: Strelow. Sad face: Guggenheim. The Brewery was confiscated from Guggenheim by the Third Reich and annexed to the Strelow business. 3. After WWII: Brewery and distributorship nationalized. 6. And South African Breweries now. 10% shares of Pilsner Urquell is said to be held by the "original" owners before nationalization. That is different from original owners before Nazi confiscation. Should confiscated property revert in interest to those who owned it at confiscation. This is not a matter of proof of ownership. Who got it? I. Town histories. Successful breweries are traced with pride. Many brewery cities have museums and tours and take great pride in their product: so does Plzen, Pilzen, Pilsen, Plzn. 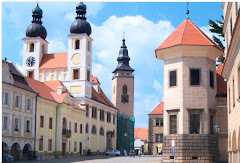 See all that fine history at ://www.click4hotel.eu/hu/nevezetessegek-pilzen-plzen. Fast forward (or rather, stagger and weave) to medieval times, and when they found a recipe for success in "bottom-brewing" that produced the lovely light color and taste, that devotees of Pilsner welcome. This became a sot's tragedy for the separate brewers in 1838 when the separate licensed brewers had to dump the brew in the streets because the fermenting went bad, and - yes! The solution in the form of a uniform methodology, and a fine new big building in which to (br-a-a-ap) do it. Read at that site about the history of the huge synagogue there, now a museum; the Jewish monuments. People disagree about whether even later "improvements" in brewing, to stainless instead of wood casks, worked. Go vote. A friend had recalled that family members in Europe had interests in the Pilsen Urquell Brewery at some time, and we checked to see if any interest remained by the time of WWII. We find no connection with their surnames yet. We remain interested in any Jewish ownership or other interest or involvement in the Brewery prior to 1900, however. Who were the brewmasters? II. But Town and Brewery Histories leave out important parts. and whether the Jewish families got their compensation. Purchasers of the Pilsner Urquell Brewery in 1900 - Heinrich Abeles and Wilhelm Guggenheim. What we have so far. Rosa Abeles. Rosa Abeles was the wife of Heinrich Abeles, and mother of Hertha Abeles. Hertha married Wilhelm Guggenheim. The families had known each other for years, and became business partners with the purchase of the Brewery - Heinrich Abeles had been in the distributing business. See the account of Rosa's life by Margo Lohr in Hamburg, Germany: "For the pause and rememberance (sic) -- against denial and oblivion" reads the closing thought. Read the original at ://www.stolpersteine-hamburg.de/?MAIN_ID=7&BIO_ID=2630. Or go to stolpersteine-hamburg.de and search for Rosa Abeles. The story of this Pilsner Urquell ownership family - the combined Abeles-Guggenheim story (especially with other Guggenheims at the time in South America and America) is compelling. This should be in the museum at Pilsen. Is it? After the years of the Reich, and the confiscation and concentration camps, who got the Brewery interests? Should they have? Wilhelm Guggenheim does not appear to be related to Solomon Guggenheim and the Guggenheim Foundation, Guggenheim Museum, NY and other interests. Guggenheim married Abeles' daughter, Hertha, and they had three children: Daniel Fritz Walter Yechiel; Heinrich Zwi; and Marianne Bluemel Berta. When Abeles died, Guggenheim took over the distributing business. The Guggenheim family was in Hamburg, Germany, at the time. The business grew- including a restaurant at Pilsen. 1933: National Socialists in power. The Reich governor issued a Sicherungsanordnung - a confiscation order as to all the Abeles passports and assets. By another Nazi order, all Jews had to pay to the Nazis 1/6 of their assets, in return for which they got a small living expense stipend. 1937: The Abeles Company was now gone. Did not exist. Jewish companies were transferred to Aryan companies. "Arische". Wilhelm Guggenheim was allowed to go to Pilzen to wrap up matters. The Abeles and Guggenheim rights in the brewery and distribution were being given to the Strelow Company: arische, or Aryan. Apparently all was confiscated, including some real estate and a restaurant. By agreement, Hertha's mother, Rosa Abeles, was to get a stipend for her life, but that was reneged in many ways. And, as part of overall Jewish disenfranchisement, the Guggenheim-Abeles business in Hamburg was seized, and the Guggenheim family home had to be sold at a pittance. They moved into a small apartment, where a neighbor denounced them. This led to a detective coming about to see if they intended to emigrate. They moved into another apartment. The Guggenheims sent two of their children, Heinrich age 16 and Marianne age 12, to England as part of a humanitarian transport. Rosa's daughter Erika (sister to Hertha) (married to Karl Wolff) emigrated to America. Rosa had had to sell her house, and was in an apartment. Then Wilhelm Guggenheim was arrested, and the Gestapo released him because of his fine service in WWI. Rosa moved into a little Inn owned by two sisters, but they eventually killed themselves because of the Nazi persecution. Wilhelm and Hertha hid. And stayed hidden. Fritz, another son I think, hid on his own elsewhere. Friends provided food. Wilhelm had been prominent - kept trying to get out with his family - most anywhere. See the site for the list of places he tried to arrange. The site says he finally got visas for Brazil for all 3. Remember that Marianne and Heinrich were in Britain. Crates of valuables, treasures, museum quality artifacts, never got to them; those they traced had accrued fees too high. The Stolpersteine site has people's recollections of what was in the crates. Treasures. Rosa Abeles, mother of Hertha (who was the wife of Wilhelm) was still in Hamburg, then was shunted first to a Jews' House, then to the railroad station for "resettlement" in 1942. She was sent to Theresienstadt .She had to pay for her own passage. Jews had been forced to turn in their woollens and furs. 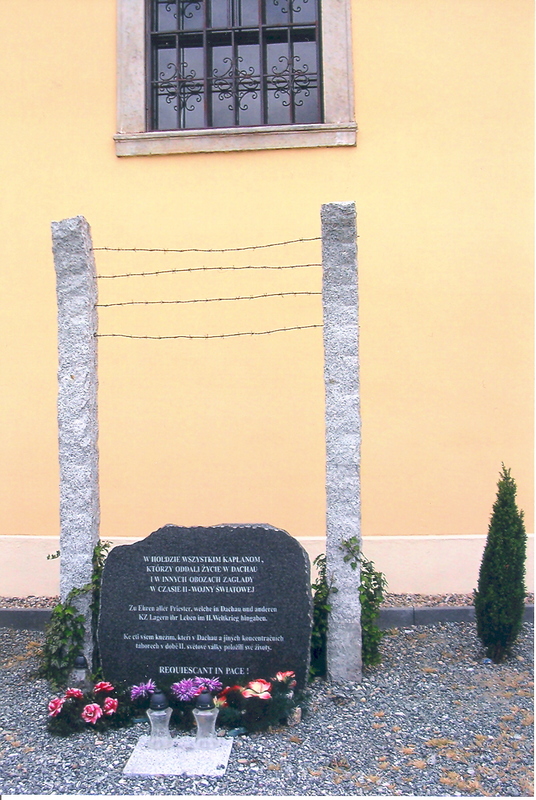 She died in Theresienstadt in the "infirmary", pulmonary disease so says the Solper Steine. One Strelow was an architect in 1935 in Hamburg, Chr. H. I. Strelow, see http://www1.uni-hamburg.de/rz3a035//moorweiden.html/ A Leopold Strelow had been an architect there in 1907 or so. See ://www1.uni-hamburg.de/rz3a035//Litzmannstadt.html No beer interests seen yet. Later information: Wilhelm Guggenheim is the younger brother of Siegfried Guggenheim, who resettled in New York, see ://findingaids.cjh.org/?pID=430964#serI/ , that other family members were already well settled in South America. At first we believed that Wilhelm, Hertha and Fritz went to Chile, see ://findingaids.cjh.org/?pID=430964/. That site tracks the Siegfried Guggenheim family estate (museum pieces, correspondence, etc). As to the two children earlier sent to England for safety, this required money for the children's support, and that many families could not afford. They were fortunate. See http://www.kintera.org/site/pp.asp?c=arLPK7PILqF&b=249802 / Heinrich may now use the name Henry Griffith, see http://www.ajr.org.uk/index.cfm/section.searchnotices/initial/G But this site says Brazil again - see http://www.ajr.org.uk/index.cfm/section.searchnotices/initial/G Recent contact with a family member confirms the Brazil.destination and the name. There is now a film, a documentary, by Jens Huckereide about the Guggenheim home in Hamburg, "Ab Nach Rio", Die Guggenheim Atke, see ://www.diethede.de/diethede/projects/projects2.html and the photograph there. Is that the Guggenheims? Gone to Rio. It commemorates the 60th year since the Shoah, or Holocaust. The film focuses on the history of the owners of the home: the Jewish Guggenheims, then acquired from them in 1938 (forced sale), by the Fritsche family, Michael and Claus Fritsche (we are trying to figure out the German -- let the cursor hover over the German word and Google will translate it), and only in 2007 sold to the State and to be a kindergarten, we understand. Stadtvilla Rothenbaumchaussee 121, Hamburg. There have been showings of the film this year. There remain proofs of the business interests. See photos and reproductions of phone book listings for the Guggenheim-Abeles business before the War, at ://search.ancestry.com/cgi-bin/sse.dll?cj=1&srchb=r&gss=affiliate&rank=1&gl=allgs&gspl=1%2cAny+Locality&pcc=2&prox=1&gsln=Guggenheim&gsfn=Wilhelm&o_xid=0001231454&o_lid=0001231454. There are many, in different cities, Berlin, Baden-Wurttemberg, Hamburg, etc. There is a photo of Wilhelm Guggenheim with a baby as well, that we understand is the son Heinrich. There are records of a Wilhelm Guggenheim out of Hamburg during the war years, then a Wilhelm Guggenheim going to Switzerland. That is a different branch. The Wilhelm Guggenheim in issues here is the Hamburg family. It is a large and distinguished family, with roots going back centuries, especially in Worms, Germany. For researching any family, look up findagrave.com. We understand that Guggenheims stem from the same root, perhaps in Worms, Germany, with prominence as early as the 18th Century. 1945. The Guggenheim-Abeles account in the Stolpersteine ends with the death of Rosa Abeles. The brewery was nationalized in 1945. Did the same Strelow Company own it at the time, so that they are the ones who own the portion of it now. There were Strelows who died in the War, one a pilot, Hans; another a U-Boat captain, Siegfried; see Buchenwald Inmate. Tale of Two Families. 1945. Nationalization. Would the arische or aryan Strelows have received any compensation when the company was nationalized after the war? See ://www.brewingtechniques.com/library/backissues/issue5.3/urquell.html/ Same family? 51% held by a Czech bank. * "Original shareholders before nationalization" got 10%. Licensed Brewer's Association. We cannot find who makes up that group. Is this, or does it stem from the Strelows in Hamburg. The wording appears to exclude the people who owned the business when it was confiscated, the Guggenheim and Abeles families. Did the Strelows retain it and now own the 10%? If the Strelows got Pilsner Urquell in 1989, then for their six or seven years of enjoying confiscated property ownership, they are much and unjustly enriched. The Guggenheims, for 38 years of ownership and then the confiscation, lost out on it completely. There are reparations procedures, and the proofs seem clear enough, but each family makes its own decisions for its own reasons. See FN 1 for information so far about the Strelows. In 1999, SAB bought a controlling interest (44% market share - is that controlling here? - here we go. Pilsner buys Radegast and after puts and calls and calls and puts and options run wild, SAB has the whole wad 100% by 2001 ) in Pilsner Urquell - South Africa Breweries. See agreement to acquire at ://online.hemscottir.com/ir/sab/rnsfeed.jsp?item=7529077752068SABMiller. Suds on Six Continents. See ://www.sabmiller.com/ and the moving timeline of acquisitions and mergers at ://www.sabmiller.com/index.asp?pageid=27And the restaurant (was it in Pilsen?) 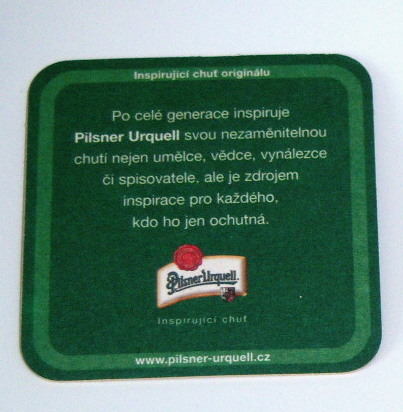 became a chain - see ://www.sabmiller.com/index.asp?pageid=149&newsid=1112 Pilsner Urquell Original Restaurants. A new one just opened in 2009 in Prague. Pilsner Urquell Kulatak in Vitezne Square. Is there a cloud on a title where property was stolen, acquired by confiscation? Experts, please stand up. Curious. Is there a statute of limitations on reparations? More curious. Why not just do something really nice for the owners from whom the brewery was confiscated. No fuss, no lawsuits, just a quiet really nice thing for them. A conscience-clearer, fog-benevolence. Let's ask the Chairman. What's the bank that owns so much of it? Ask their Chairman. Modern Annual Report and History. SABMiller in its 2005 Annual Report gives a modern history of Pilsner Urquell, known in the document by its Czech name, Plzensky Prajdroj. The history does not go back far enough for this cultural icon, and symbol of the Shoah. See ://www.prazdroj.cz/en/o_spolecnosti/_download/prazdroj_ar_05.pdf See Michael John Short smile. Ask if he knows of the Guggenheims? * Something like po cele generace inspiruje Pilsner Urquell svou nezamenitelnou chuti nejen emelce, vedce, vynalezce, ci spisovatele, ale de zdrojem inspirace prop kazdeho, kdo ho jen ochutna. 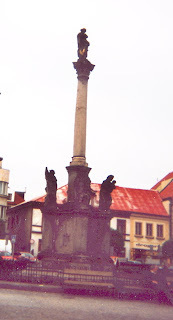 What happened with Wilhelm, who received the Abeles portion of the Pilsner Urquell Brewery before the Reich, upon the death of Heinrich Abeles. Did the Abeles family have any interest left after the death of Heinrich, and what was given to them by Wilhelm for Heinrich's interest. Wilhelm's children: two went to England during the War.A Brazil component thereafter is beyond this look. 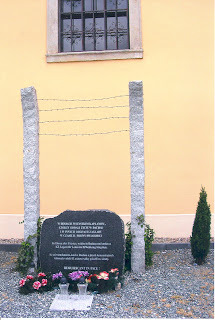 See Germany Road Ways: Buchenwald Inmate Siegfried Guggenheim also was in Buchenwald briefly. See http://findingaids.cjh.org/?pID=430964, estate of Siegfried Guggenheim, correspondence; and http://digital.cjh.org/R/?func=dbin-jump-full&object_id=430964&local_base=GEN01. Interest moves back to the Strelows, the company that annexed the Brewery at confiscation. Tracking, tracking. It is not an unusual name. How to tell which is which. There is an Albert Strelow in the index to a history of the Ford Motor Company, and the moguls in industry over decades, see http://cgi.ebay.com/FORD-MOTOR-COMPANY-DEFINITIVE-ILLUS-HISTORY-EPIC-BOOK-/130417957109; and Albert Strelow was one of the first investors, see http://www.railbirds.com/blog/333119/71510-today-in-history.html. There is a Gallerie Heike Strelow, see ://www.galerieheikestrelow.de/cms/front_content.php; and Heike Strelow is also an author, see ://www.flipkart.com/oekologische-aesthetik-heike-strelow-theorie-book-3764324236; lots of people named Strelow over here, see ://pipl.com/directory/name/Strelow/William -see also the name Roger. Hans Strelow, Siegfried Strelow. Other source: An "elite of the Third Reich" is Siegfried Strelow, and also Hans Strelow, see pages 335-336, ://books.google.com/books?id=inwd2rDaLm4C&pg=PA336&lpg=PA336&dq=Strelow+Company+Reich&source=bl&ots=-JXsNWwi8v&sig=4-hXhGxVfVEQCKFGJVc6MqvkMuA&hl=en&ei=NElhTK33EYL6lwfNpujDCw&sa=X&oi=book_result&ct=result&resnum=6&ved=0CCUQ6AEwBQ#v=onepage&q&f=false . Both received the Knight's Cross of the Iron Cross. Read about Hans the pilot - A "German Luftwaffe figher ace", see ://en.wikipedia.org/wiki/Hans_Strelow/. See also ://www.military-art.com/mall/more.php?ProdID=16657 (do a find for Strelow). He was shot down behind Soviet lines, and killed himself to avoid capture. Someone vet Wikipedia on that. Siegfried, the U-Boat commander, is not listed as a relative of Hans, and no indication of death during wartime, see ://en.wikipedia.org/wiki/Siegfried_Strelow/ Common name, no relation probably. For a time, we thought another family, Czech, might have an interest in the brewery at the time of WWII, but apparently not. We had posted more on the Strelows at the site concerning the only survivor of the European branch of that family, but have no confirmation that the information there is the confiscated brewery family same family. 2010. There are 30 Strelows in the phone book in Hamburg (not necessarily the same family, of course, but a continuing name presence). There are two "Hans" and a hyphenation as the first name. The pilot's line? GAnd the company still deals in -- go look at the bubbles at http://www.strelow.de/index.php. - adult beverages. The tall glass of bubbly there has a nice head. Also wines? There is a nice picture of "the team" and we see no Strelows, so maybe this is no connection at all. Did they sell and sell the name with it? Or never have it. "Already in 1891 (the Strelows or the Guggenheim-Abeles?) the foundation stone for the traditional Hamburg company has been laid. In addition to the tradition, it is to be a joy for us, always a valued partner for the hospitality and retail. "We offer our customers a high quality and market-oriented Topsortiment with a variety of domestic and international beverage specialties." Henry Griffiths Update, much later than received. This is 2012. A comment that I cannot publish because it gives a real name and an email, but here is the neutral part: "The Picture of Wilhelm Guggenheim with a baby was posted by me. The baby was my father, Henry Griffiths, nee Heinrich Zwi Guggenheim. My name is______________________(deleted identifying information)"
This blog seems fairly accurate and is an exercise in logic. It's quite impressive to how someone completely unrelated to the families involved have taken such interest in the subject. I believe the subject deserves attention and further research.